Google App Engine Datastore presents interesting challenges for someone used to relationship databases. 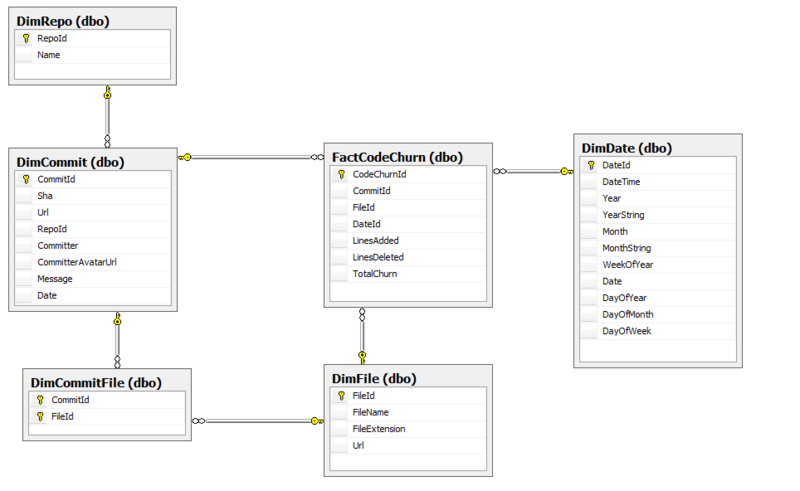 If you trying to make sense of somebody else's system with SQL backend, you look into databases, tables and query them to understand a database model which is often a key to understanding the whole system. Since Datastore is schemaless, this reverse engineering approach doesn't work. You can see the entities and their properties, but it is much harder to get a sense of their relationships. What also seems bizarre is that entities of both types will peacefully coexist - Commit entity with Repo parent and Commit entity with Repo child. Go figure how this is really supposed to work. Of course there are more ways to design such a model. There could be Commits ListProperty in Repo entity and / or Commit entity could have Repo Id(sort of foreign key). Such design would carry "schema" meaning, but it is only applicable in certain conditions since children entities will be embedded into parent ones. It all depends on how entities will be queried. See code in my playground project.